Fuchsias are members of the evening-primrose family. Also known as lady’s eardrops, they have red, pink or purple flowers hanging from the end of vines. Buds form on the tips of the vines and open into small flowers. 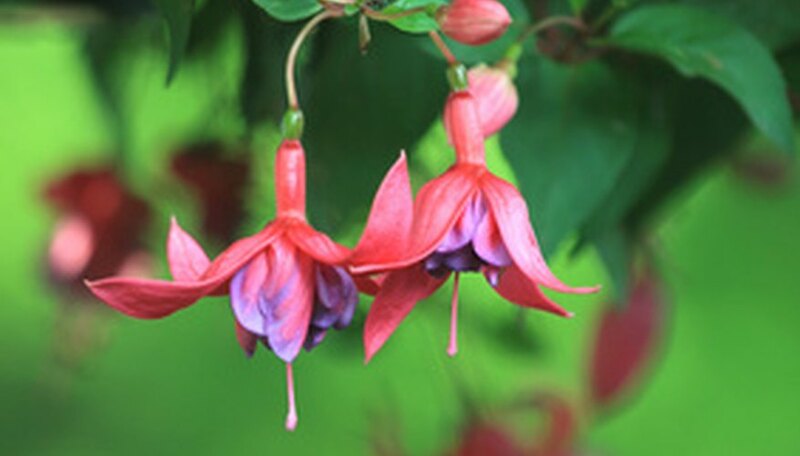 The fuchsia is ideal for a hanging basket because of its long flowering vines that grow downwards. With a little care, fuchsias will thrive whether grown indoors or outdoors. Hang the basket in a location where it will receive indirect sunlight. The ideal spot outdoors for a hanging fuchsia is a north location that gets afternoon sun. Indoors, the fuchsia will do well in a west, east or south window, but you will need to check the soil daily to make sure that it isn't getting too dried out. Water the hanging fuchsia when the soil is just moist. Don’t allow the soil to dry or the flowers will wilt and fall off. When it's warm, mist the plant with warm water a few times a day. This will provide the humidity that the fuchsia likes. Fertilize the soil in the hanging fuchsia with a 10-10-10 (nitrogen-phosphate-potassium) water-soluble compound once a week when the plant is flowering during the spring and summer, and every two weeks after it stops flowering. Repot the fuchsia every year in the spring, using a good houseplant potting soil that drains well. You can also create your own planting mixture by using equal parts garden soil, perlite or course sand, and moist peat or humus (leaf mold). Add a dusting of lime to the mix and blend with your hands.